Do you want to ignore friend request on Facebook? 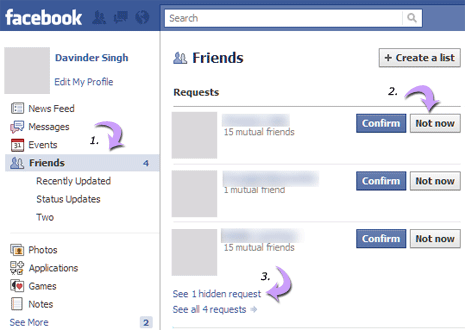 Ideally, there is option to confirm yes or no to Facebook friend requests. However, now you can ignore any received friend request to consider accepting it in future using ‘Not Now’ option. ‘Not Now’ feature does not delete or mark NO to incoming friend request on Facebook. It works like ‘read it later’, you can come back to ‘not now’ marked (hidden) friend requests anytime for reconsideration. 1. Login into your Facebook account and click ‘friends’ on the left sidebar. 2. 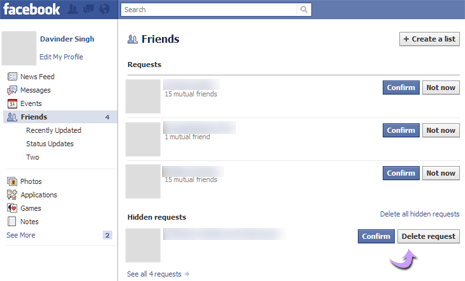 You will see list of received requests to be friend on Facebook. Click ‘Not Now’ button to hide specific friend request which you can consider it anytime in future. 3. On the Friends page, click ‘see hidden request’ link at the bottom’. 4. This will display hidden friend requests that were marked ‘Not now’ previously. You can confirm YES to friend request or delete it by clicking ‘delete request’ button. In order to see the hidden friend’s request you have to have other requests in the friend’s area it seems. Right now I have several hidden friends request that I’d like to deny but have no idea how to get to them! Found the button — go to “Friends” page, and click “Edit Friends” at top; then “Friend Requests” on left side of page — hidden friend requests will appear. sorry, “3. On the Friends page, click ‘see hidden request’ link at the bottom’.” doesn’t exist! Well the whole procedure is a little annoying if you wanted to ignore the friend request from the very beginning. It’s a cool feature but why remove the ignore button?